– Fill the gas tank to help prevent condensation from accumulating in the gas tank. Add a fuel stabiliser and drive the car around a bit to distribute the additive to engine parts. – Wash and wax the car thoroughly to protect the finish. – Place a vapour barrier on your garage floor. A 4-mil polyethylene drop cloth will do. – Disengage the parking brake to help avoid brake corrosion. – Put the car on jack stands to take the weight of the vehicle off the wheels and tires. – Disconnect and remove the battery to keep it from draining. Place the battery on a trickletype charger. Or periodically drain the battery, using a small light bulb, and then recharge it with a low-volt charger. n Plug the tailpipe with a rag to prevent moist air from infiltrating into it. Of course, a garage is always the ideal place to park your car. But if one isn’t available, minimize interior damage from UV sunlight and heat by always trying to park your car in the shade. If no shade is available or if you find parking under a tree results in bird droppings, use a car shade to minimise the sun’s impact. As a bonus, you’ll have a cooler car to step into on hot sunny days. Car shades come in two basic types: those that you unfold and place on the front windshield and rear window, or pleated types that attach to the windshield posts (with adhesive), window frames (with Velcro), or the windows themselves (with suction cups). Vacuum and sponge your interior every time you wash your car. Dirt particles are abrasive, and spilled liquids, such as soda, can be corrosive. Vacuum your interior thoroughly with a powerful vacuum (small cordless models are generally too weak). Use the appropriate wand heads when vacuuming. The bare metal wand can mar and scratch surfaces. Sponge vinyl surfaces clean with a solution of mild detergent and water. Use floor mats to protect carpeting. The best type for controlling salt, slush, and mud in winter are rubber waffle style mats. They stay in place, don’t allow the water to seep through, and are easy to wash clean. Carpet-style mats are helpful, too. Shake, vacuum, or wash as needed; replace them as they wear through. When washing your car, drag out the rubber or carpet floor mats and blast them with the hose. This will dislodge dirt particles that, if allowed to build up, will grind holes in your mats. Let the mats dry thoroughly in the sun before reinstalling them. After vacuuming floor mats or interior carpeting, apply foam rug cleaner to resistant stains as directed by the maker. Work the foam into a few square feet at a time, using a wet sponge or brush. Vacuum when dry. Wipe a rubber protectant (such as Armor-All) or silicone on door and window weather stripping to keep it in good condition. Don’t use an oil based product, such as WD-40, because the oil will damage the rubber. Regular cleaning and treatment of your car’s weather stripping will also lessen the likelihood of your door sticking to its rubber seal in cold weather, a common cause of damage to the rubber. If your weather stripping is letting rainwater leak into the interior of your car, take a look at it and decide if you can repair it or if it needs to be replaced. Small leaks can be handled with brush-on seam sealers. Re-secure loose sections, not otherwise damaged, with trim adhesive. Torn sections may be repaired with special caulking available at auto parts stores. You may also be able to extend the life of worn-but-intact sections by inserting foam rods, available at automotive stores, into the hollow section of the weather stripping. If you decide to replace entire sections of gasket, don’t simply buy generic stuff such as you’d use around the house. 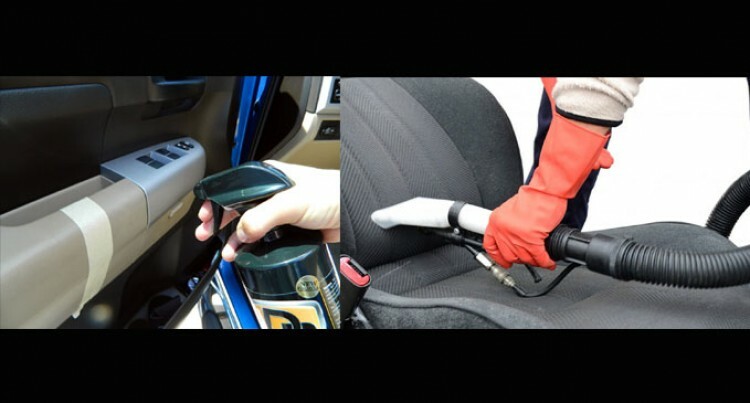 Buy a product that matches your car’s original weather stripping — it’s available in a wide variety of profiles from dealerships and automotive mail-order catalogues. Leather cars seats are durable and don’t require a lot of maintenance. After a few years, however, the seats can become soiled. Use a leather cleaner to remove dirt and stains.Then apply a leather protectant formulated for pigmented or top-coated grain leather (the leather used for most leather car upholstery). Protectants will resist stains and make the upholstery easier to clean in the future. Choose a protectant that includes conditioners to keep your leather supple. Spraying fabric car seats and carpets with a fabric protectant, such as Scotchgard, will make them resist dirt and stains, and make them easier to clean. Thoroughly clean the fabrics before using one of these products and then test the product on an inconspicuous place to be sure the treatment will not discolor the fabric. All manner of food bits and liquids can accumulate under a baby seat, where they can permanently stain the upholstery. Place a sheet of heavy plastic and an absorbent towel under the seat to prevent damage, and re-secure the seat according to the manufacturer’s directions.